Something traditional but different in a winter holiday image — that was what I was after here. Good cheer and hospitality, but no holly or Santa or snowmen. No red, no green. How about black and white? How about a picture that wouldn’t seem out of date on Dec. 26? Something decorative that would have some appeal until at least early February, when Valentine’s Day gets us thinking of glittering red hearts? 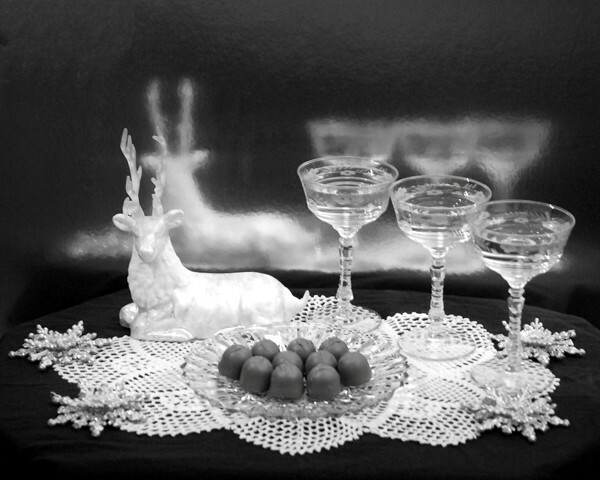 So I put together and shot this still life in my studio, uploaded it to a faraway printer to have holiday cards made, and showed it later in the winter, printed on metal, in the “Shine” show at the Trolley Car Bar & Grill, one of the landmarks in Jersey City’s new Riverview Arts District.